So happy that my paintings are on display at the Hive Gallery at 321 Main Street in Schoharie, NY. My produce "portraits" are a tribute to the Upstate New York farms and farmers who work so hard to supply our family with beautiful, fresh produce throughout the growing season. 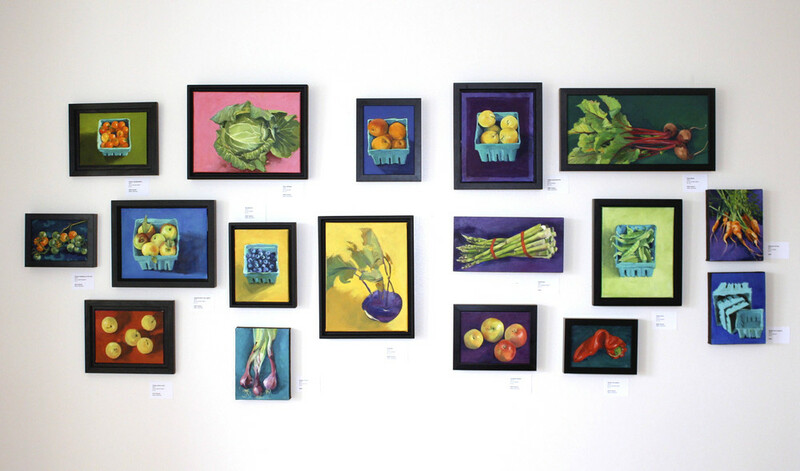 The show features oil paintings, giclee prints and cards and will go through the end of July. Please stop by for the opening party on Saturday, June 27 from 1 - 4 p.m.
10% of artist proceeds will be donated to the American Farmland Trust "No Farms No Food" campaign. These days it seems we have a superabundance of everything. Too much cold in winter. Spring days that are too beautiful, because too dry. And now too much rain. In the rolling glacial plain where I live, the old farm families are leaving their land. Too many rocks. Too much work and too many worries. Fields where cattle and sheep used to graze are now covered with too many small trees and weedy shrubs in dense thickets. This painting is from a photograph I took in New Salem in January 2011. My mother always looked to the bright yellow willows and red saplings as a sign that winter would turn to spring. I made this painting this winter in her memory.